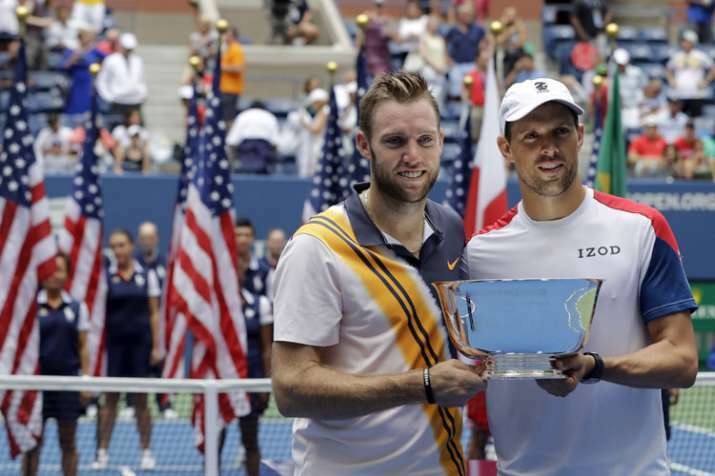 The pair won its second straight Grand Slam doubles title together, beating Lukasz Kubot and Marcelo Melo 6-3, 6-1 on Friday at the U.S. Open. Mike Bryan, now with more Grand Slam doubles titles than any man, can pick his partnership next year. He can go back to twin brother Bob, who expects to return from a hip injury. Or he can stick with Jack Sock, keeping together a perfect pairing in Grand Slam tournaments. "I think Bob is maybe the front-runner if he gets healthy," Mike said. Sock sure has given him something to think about, though. That gave Mike Bryan his 18th Grand Slam doubles title, breaking a tie with John Newcombe, and at 40 years, 4 months he became the oldest Grand Slam doubles champion in the professional era. Six of his titles, also a record, have come at the U.S. Open. The first 16 titles came with Bob, who was sidelined. So Mike contacted Sock, a past doubles champion at Wimbledon who wasn't planning to play this year so he could focus on singles. "They are the greatest team to ever play this sport in doubles, and to be able to be a part of that on the same side of the court — I mean, I have played against them many times, and seeing what that looks like is not fun," Sock said. "So, to be on the same side with one of them and to now hold two pretty big trophies is extra special." So what about the idea of keeping a good thing going? "If Bob and I lose our first match, then we'll talk," Mike said. He added that his brother has been supportive of the team, and even called and talked to both players immediately after the match. Mike said his success with Sock has motivated Bob in his recovery to come back and leave tennis on his own terms, instead of because of injury. He joked to Sock that maybe he could play Bob for his spot, though Sock understands he's just temporary. "I'm the triplet now, I think," he said.